Schmetterling Aviation: Weather or not? - Whether or not to spend the not inconsequential $1,150 to upgrade my Skyview with the ADS-B module. The second, not so much, but not for the reason you may suspect. It came down to cost/benefit decision, but not with regards to the lucre. It came down to the difficulty of the installation. So, yeah, dry as overcooked turkey, that. 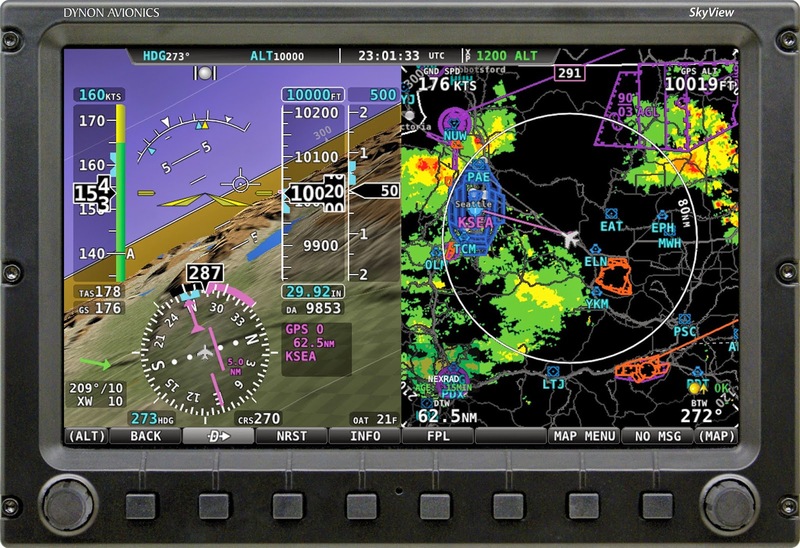 I did you the favor of highlighting the two most salient parts: with ADS-B, I will get weather information displayed on the Skyview, along with improved traffic detection. In the picture above, consider the right side. Imagine this is me arriving in a area of unforecast bad weather, trying to figure out where to land. 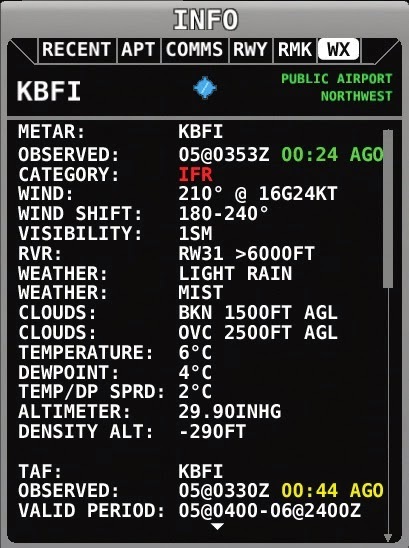 You might guess I would head for either KTCM or KGRF since they are unquestionably VFR (going in ascending order of desirability: IFR, LIFR, MVFR, VFR), but I probably wouldn't. My first choice would be KTIW because of the much higher winds at both KTCM and KGRF. I saw 'probably' because other factors would enter into the decision making, particularly the topology of the area. If it was mountainous, for example, I might be more leery of the 2,200' ceiling at KTIW. Let's hope I never get a forecast quite that erroneous, but.... it can and does happen. Best to be prepared. 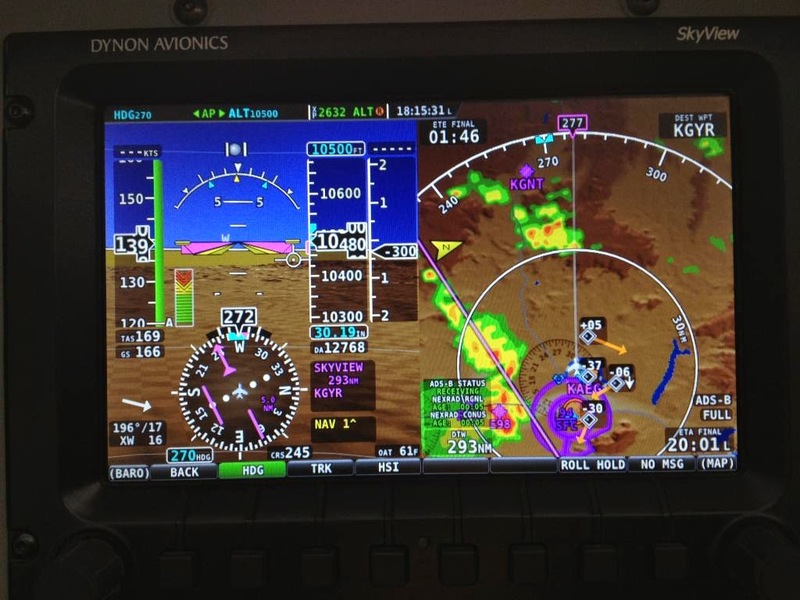 This next picture (borrowed from an RV-12 builder who borrowed it from "Karl's picture of the Dynon SkyView installed in his RV-8 displaying ADSB weather and traffic on the right half of the screen"), also shows the traffic display. Note that the Skyview I have also displays traffic, but it does so based on signals received from ground ATC stations. There are places, such as the southeastern region of Ohio, that have radar blindspots and thus provide no traffic information. That's how a Beech Bonanza ended up nose-to-nose with Kyle and me one day, but luckily a few hundred feet lower. 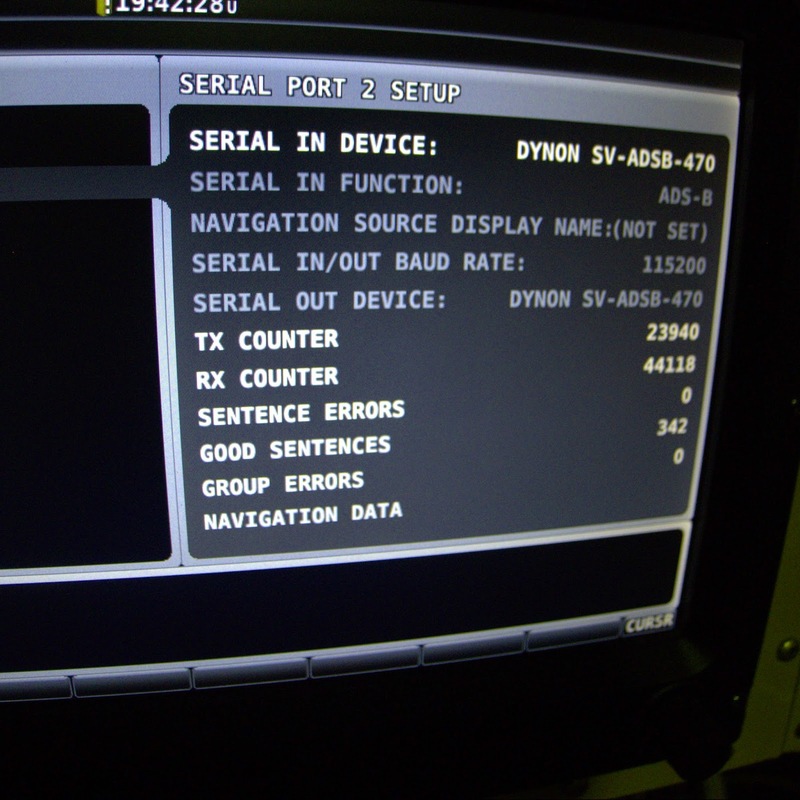 This next one is an official Dynon screen shot, demonstrating (unintentionally) precisely what not to do with ADS-B. This shows a pilot headed directly into a thunderstorm that appears to be northwest of the airport. The pilot is presumably going to "thread the needle" between the storm and the airport. This is ill-advised because 1) thunderstorms can move pretty fast, and 2) there is an inherent lag in the update rate of the radar information - the data is commonly 15 or so minutes out of date by the time it gets to the screen. Still, it's representative of 'big picture' weather information which, if used properly, can be of tremendous benefit to someone flying a 700 lb. airplane. So, with all of the glorious benefits, what kind of installation hurdle would give me pause? The problem is with Van's. In the directions provided with the retrofit kit, they detail an installation process that would require me to run a big, thick antenna cable from the top of the comm radio, where they have us mount the new box, all the way back down through the tunnel and into the tail cone, behind the aft baggage bulkhead. No one, and I mean NO ONE, wants to do this. The reason for this lengthy wire run is to provide separation between the existing transponder antenna and the new ADS-B antenna. Let's stipulate for a minute that that distance is an absolute requirement. Others have looked at this and echoed my "No *!^#~} WAY!" sentiment. They have decided instead to mount the electronic box in the tail cone and buy a new wiring harness to carry the signals from the tail cone up to the front of the plane. The presumption here is that the wiring harness will be easier to push through the very crowded tunnel than the thicker antenna cable would have been. Even then, at least one or two people have decided against that as well and run the wires forward by routing them along the side of the interior fuselage skin. Being a good little Van's citizen, I decided I would take the harder road and do it Van's way. As much as I hated the idea of dealing with those little plastic wire-retaining blocks on the fuselage floor, it seemed do-able. Having decided to lean in that direction, I did something I seldom do: I read through the entire process. That's how I came across "remove both flaperon torque tubes." Let's leave it at that for a few moments. I decided to do some of the routine maintenance first, while I thought about how to proceed on the ADS-B installation. So, up on the jacks she went. The brake pads were worn just about to where the wear indication would indicate sufficient wear to be aware of the need to replace them, so off came the wheels, if case you're wondering where they are. This is one of the outer pads compared to a brand new pad. They aren't completely worn away, but at $33 for the replacement set, why wouldn't I just do this every year? It does require a special tool to de-rivet the old pads and rivet on the new ones, but since any airplane owner, whether the plane is certificated as Experimental or not, can replace brake pads, I've had this tool for years. Even if I hadn't, it is a very reasonably priced tool at $36.50. The first step is, of course, the removal of the old pads. 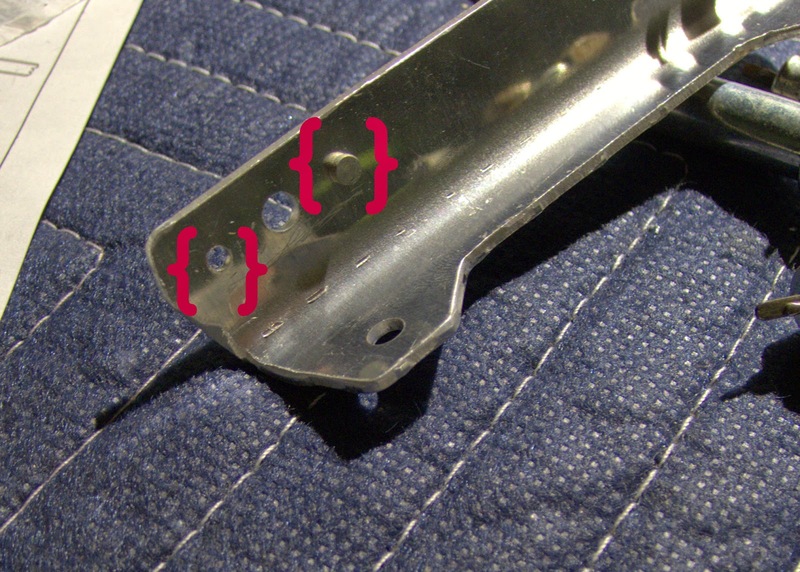 This is done by leaving the outer/bottom part of the tool 'open', which gives the rivet head somewhere to go as it is pushed out by the pointy part of the inner/upper part of the tool. I work on one piece at a time so I always have an assembled piece to use as a reference so I don't get the pad mounted on the wrong side. Here is a new pad laid into position. The pointy part of the tool is replaced with the conical part, which will squeeze the new rivet into place, and the hole in the outer/bottom part of the tool is filled with what I call the anvil. This will press against the head of the rivet while it is being squeezed. This is the first new rivet being squeezed into place. 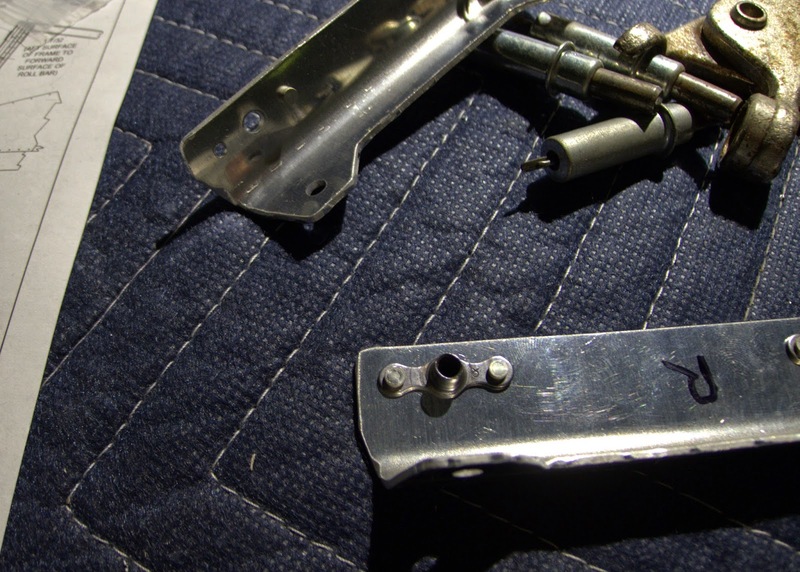 There is another rivet in place at the other end of the pad - it's function is to keep the pad from moving out of alignment while the first rivet is being squeezed. I failed to do this once. It's not a mistake that you make a second time. Before and after: the new pads are in place on the mounting plate to the left. The mounting plate on the right makes me wonder if I've been leaking some brake fluid - it needed quite a bit of cleaning. The inner mounts are done in pretty much the same way, although they use the larger size of the two rivet sizes included with the pads. The oil had been draining (sharp readers will have noticed from the sawhorse picture that the oil preheater was plugged in - this would be why) while I was working on the brakes, so by the time they were done the oil was gone and I could remove the magnetic plug for inspection. There was still oil to leak out once the plug was removed, but it was less, I guess, than it would have been. The magnetic plug is intended to catch ferrous metals as they swim by in the oil stream to provide early warning of an engine that has decided to self-cannibalize. There's also a recurring inspection to make - this little probe is intended to show if the PTO journal has cracked. And no, I really don't know what function a PTO journal is intended to provide for, but my guess is that it provides rotational force for engine attachments like a second alternator. The RV-12 doesn't come with this second alternator, but planes with heavier electrical load requirements do. In any event, it can apparently crack without showing any visible distress, so we test for it. With all of that done, the wheels went back on. I finally broke down and bought a sufficiently big socket for the axle nut. I had been doing this with a big adjustable metric crescent wrench (inside joke), but I couldn't get the nut tight enough to hold the bearing seals in place. As opposed to every other airplane that I have had, these Matco wheels have a rubber seal on the outside of the wheel bearings. This is intended, I think, to keep sand and grime from getting into the bearings. It seems to work; I took the bearings over to the airport mechanic shop to use their cleaning sink to clean out the old grease before repacking with new and the head mechanic there wondered why I was even bothering. The old grease still looked brand new. Alas, the bearings get repacked every year whether they need it or not. It's really kind of a pain because the rubber seals make it much, much harder to push the grease into the bearings. I tried using the little needle valve that Matco sells, but I was only able to get a little grease in the tiny gap between the bearing and its race (if that's the right word) before having to push the rest in my hand. So, why the big socket? The Matco wheels, because of the integral rubber seal, are tightened differently than the older style wheels. With these wheels, you have to tighten the axle nut until the black rubber seal won't turn when the wheel is turned. It takes more torque to get them that tight than can be delivered by a wrench that can only achieve partial grip on the nut due to the nut being down inside the wheel. Fooling around with all of that routine work gave me time to ponder the ADS-B job. 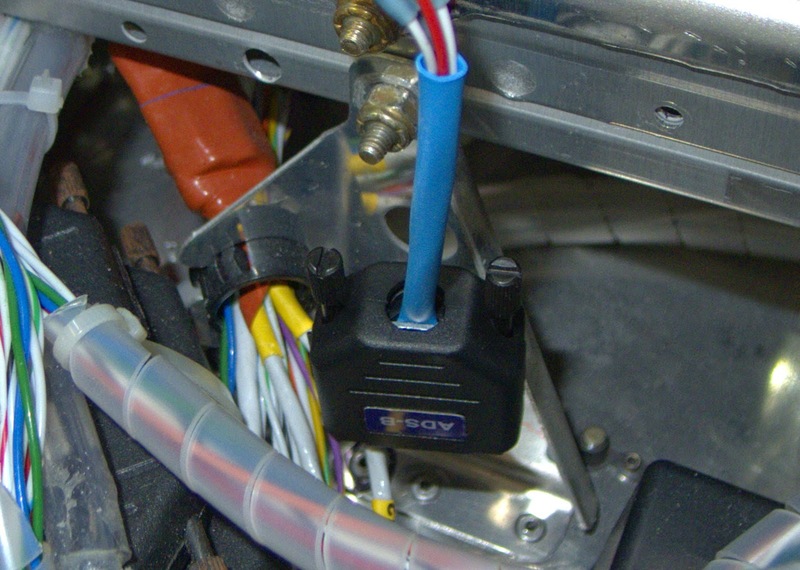 It also gave me time to research why Van's put the antenna so far back in the airframe. 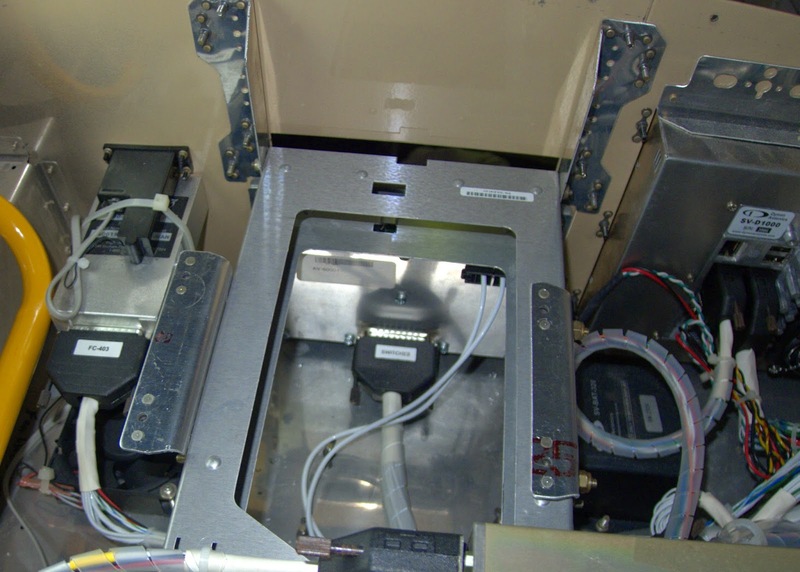 Van's (correctly) has a tendency to expect the builder to use the instructions and procedures detailed in the manuals that come with things that Van's doesn't actually make, like the engine, wheels, brakes, and avionics. Oddly, they also have a tendency to provide directions that don't always reflect those provided by the manufacturer. There's a heckuva lot of difference between 24" and 10'!! I started looking for a more suitable (for installation, anyway) location for the antenna. Now, before I proceed, I want to say that anyone choosing to install a Dynon ADS-B with the antenna located where I put mine does so at their own risk! At the time of this writing, this antenna location has not been tested in flight. Disclaimers out of the way, I found a spot over on the passenger side. This location on the pilot's side houses the autopilot pitch servo. Over on the passenger side, it just sits there empty. I originally thought about putting the antenna doubler on the inner side of the bay, but later decided to move it to the outboard side to ensure that I was getting it as far away from the transponder antenna as possible. Also note that the doubler is turned 90 degrees from its proper orientation in this picture. I was still a little reluctant to drill a big hole in the belly of the plane, so I procrastinated by installing the electronic unit first. The radio is easy to remove from the tray, so I got it out of the way. 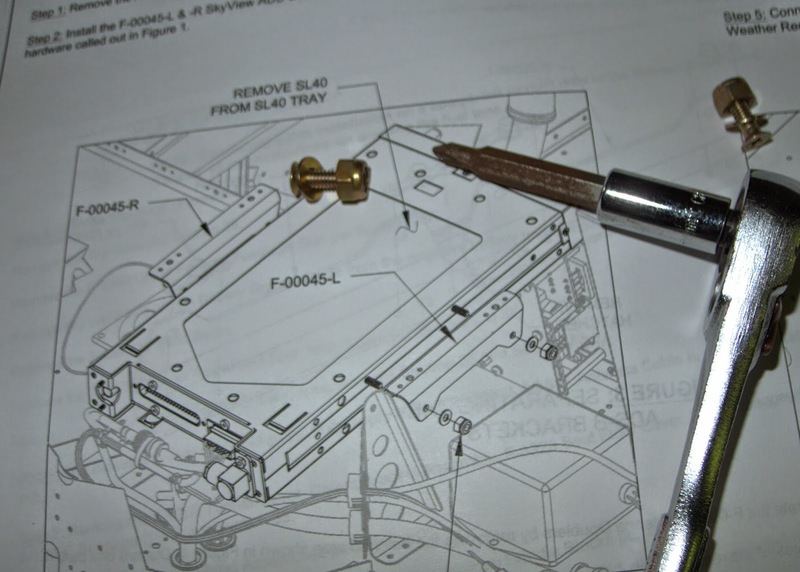 The radio tray stays in because that's what the ADS-B box is going to mount to. I went ahead and drilled a new hole for the antenna cable to go through. 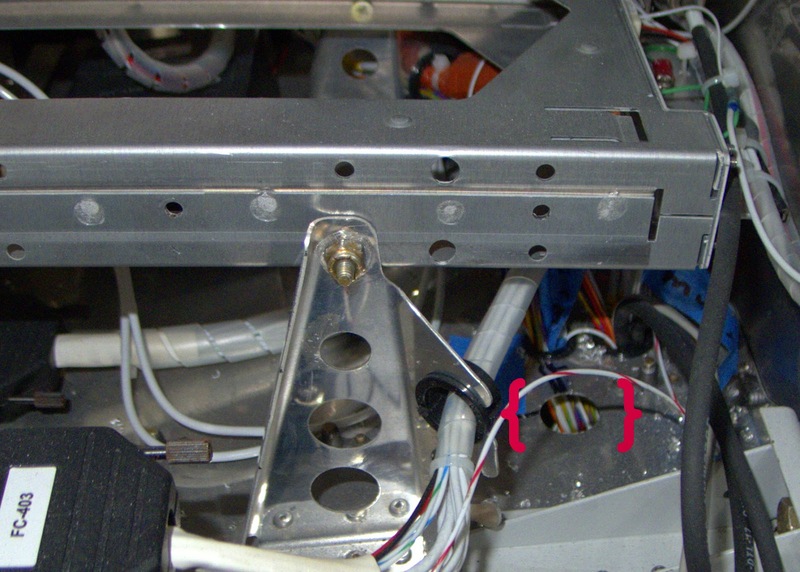 The next step was to prepare the mounting brackets by installing nutplates. I haven't done nutplates for a year or so, but after doing literally hundreds during the build I figured it would come back to me easily enough. I missed capturing the nutplate 'ear' on the first rivet. Note the existence of the rivet but the stunning absence of anything else. 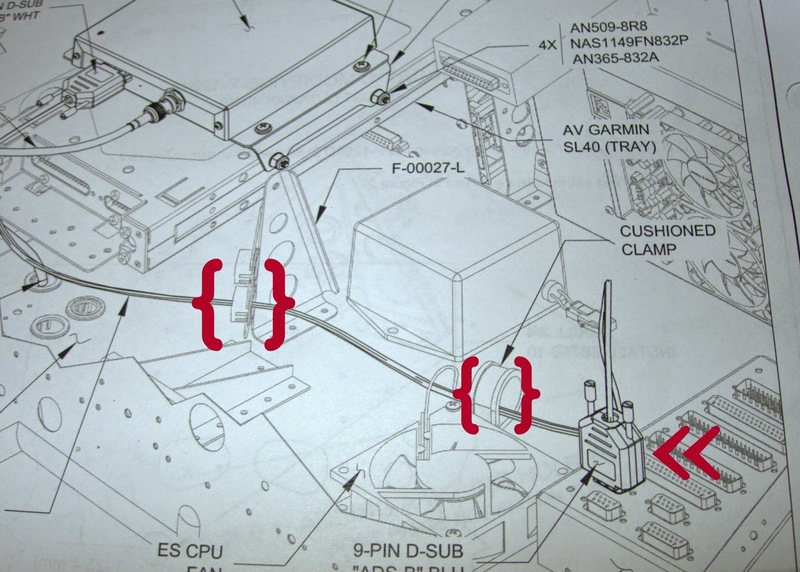 It takes some studying of the picture in the installation instructions to realize that the mounts will offset the ADS-B box from the radio underneath it. Note also that I have screwdrivers that are too long for the job, and screwdrivers that are too short for the job. I had to kludge together a "just right" screwdriver. The downside of this solution was the reminder that my nice Craftsman 1/4" drive ratchet is slightly broken - it won't hold the socket on anymore. I must have dropped the screwdriver head off of it a dozen times, each occurrence eliciting a harsher or louder epithet than the previous, and in some notable occasions, both. I'm tempted to test the Craftsman Lifetime Warranty on this thing, but I imagine I would be disappointed. Here you can see the proper orientation of the mounts. Study it carefully - it's easy to get them backwards, and if you're struggling with a slightly broken tool, the last thing you want to have to do is re-do the installation. Yes, yes, ask me how I know. So, again about Van's. I sometimes wonder if they actually field test their instructions. 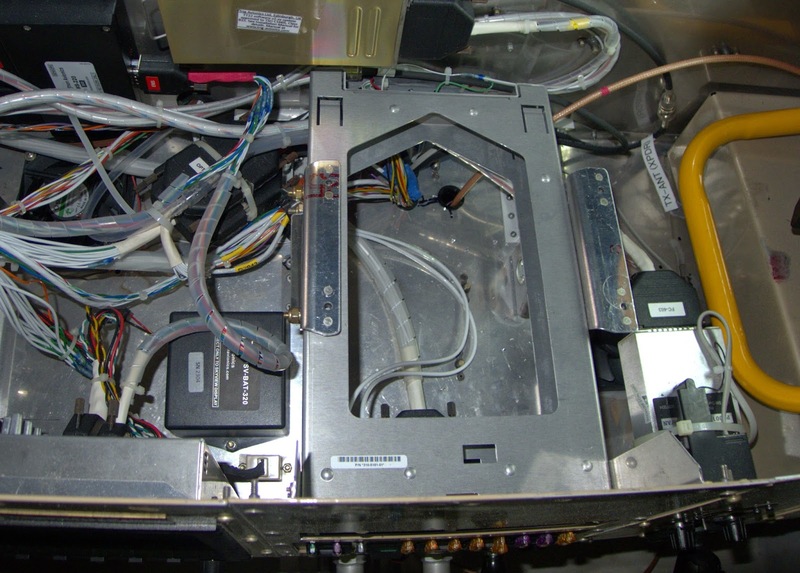 Consider the wiring harness. Just so you can imagine what is to follow, here is the harness as it comes from Van's, albeit after I wrapped it with the plastic wrapper that I use to keep the individual wires getting tangled up like Christmas lights, or angel hair pasta, whichever analogy you prefer. Pay particular attention to the size of the connectors. 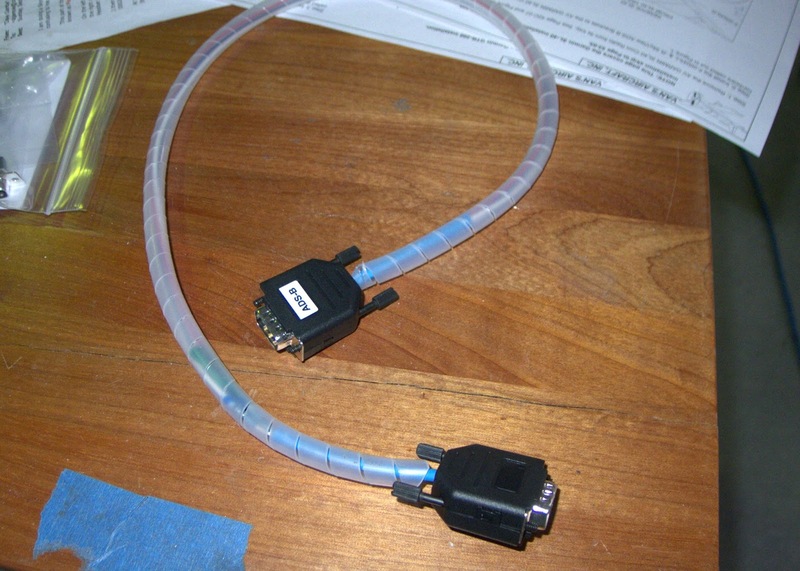 Now see if you think that cable is going to be routable as depicted in the instructions. It wouldn't fit even if that hole wasn't already filled with wires! I solve that problem in my usual way: I ignored their instructions. Oh, and the antenna? 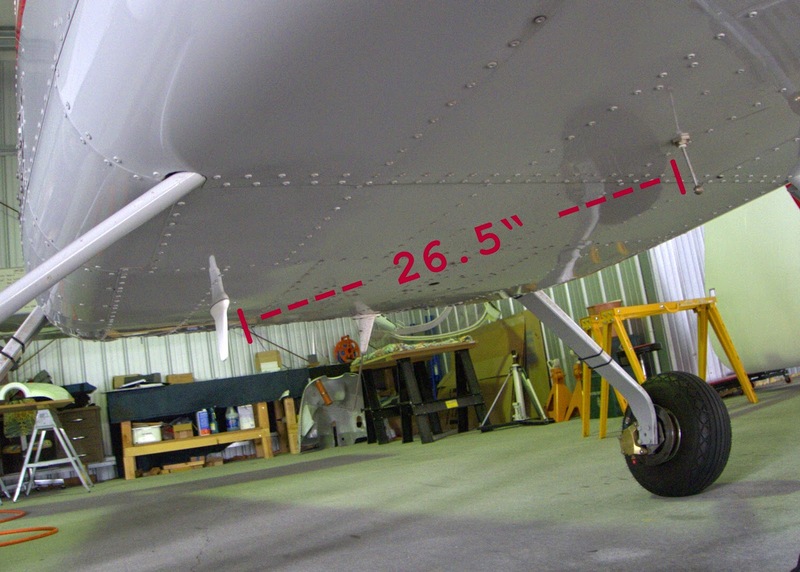 Easy-peasy to mount, and the location exceeds the Dynon-specified distance requirement by a 10% margin. Here's how you know it's working well enough to justify a test in the air (the antenna can't pick up the ADS-B signals while sitting on the ground in a hangar) - note here that Van's gave incorrect directions on how to get to this page. You use the System Settings menu, not the Local Display Settings menu. 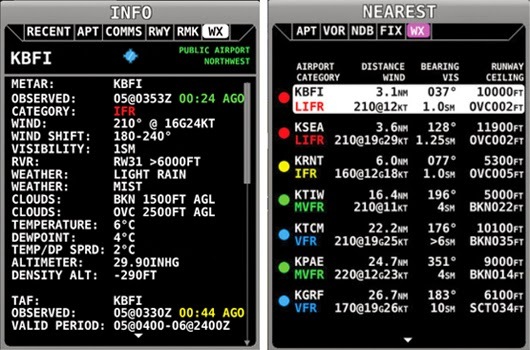 The TX and RX counters indicate that the ADS-B unit is in communication with the Skyview. To be fair, the communication setup was easily accomplished by importing a config file provided by Van's. They usually get the big things right. There's still work to do on the ADS-B - the antenna cable needs to be restrained from floating around loose under the floorboards and a new weight & balance needs to be computed. There's also more work to be done on the annual inspection. Once all that is done, stay tuned for an in-air test of the ADS-B!